Juliette et Chocolat – Montreal Series | ohdenny. On our last day to Montreal, we didn’t really know where to go so we just walked around. After a couple of hours exploring, we found Juliette & Chocolat. It wasn’t even near lunch time, but this place seemed so inviting for morning tea cocoa. 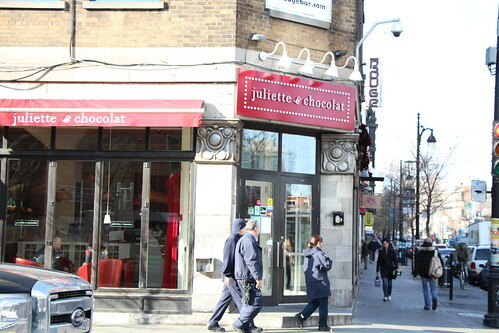 Juliette et Chocolat specialises in all things chocolate, and they certainly do it well and with flair. 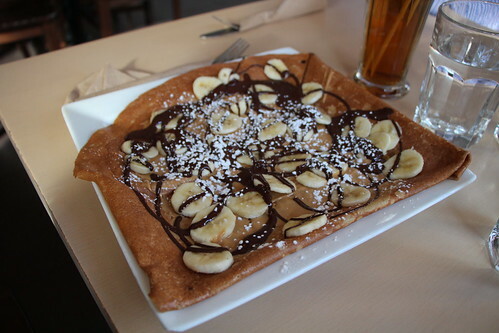 Being Montreal, we had to try some crepes, and with chocolate, bananas and peanut butter, this sounded like a dream come true. The crepes were very thin and light, with the creaminess of the peanut butter and rich chocolate. It was simply fantastic. The slightly sweet bananas gave it a freshness and well it doesn’t cut through the richness, but it certainly doesn’t make you feel overwhelmed by the sweetness. I loved it. I had to order the Passionfruit petit pot, I was thinking about the Hazelnut pot but I really do love the blend of passionfruit and chocolate. It’s simply amazing. As you can see it’s multi layered, with the passionfruit layer on top, then a layer of cocoa ganache, and at the bottom a dark chocolate and passionfruit mousse. It’s so light and just melts in your mouth. Fantastic mousse. The passionfruit coulis was sweet as expected but the flavour of it just works so well with the mousse and ganache. Ah, it was chocolate heaven. 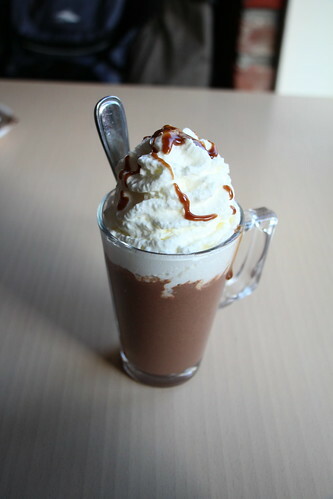 As a drink, we ordered one of the warm hot chocolates with whipped cream. It was definitely creamy and rich but oh so chocolately. I think after this we had an overdose of chocolate but very satisfied in the end. 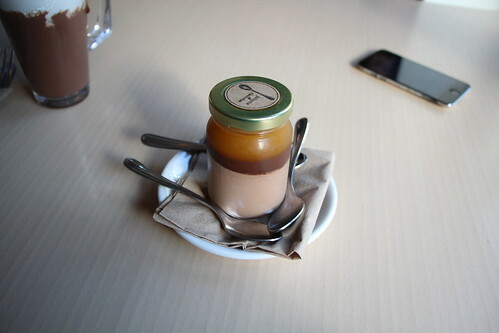 Juliette et Chocolat was definitely a highlight for places to try in Montreal. It does chocolate very well, their crepes, desserts and drinks. It really is fantastic for chocolate lovers. I’d definitely make time to try other things on the menu if I ever go back to Montreal.